$189.00 KitchenAid K45SSWH Classic White 4.5-Qt. Stand Mixer with Tilt-up Mixer Head, 10 Speed Control - dealepic . 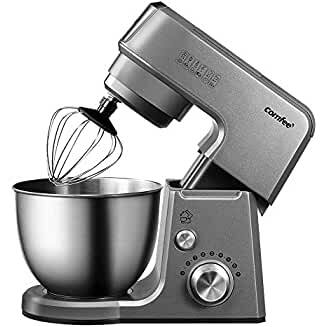 The KitchenAid Classic White 4.5 Qt Stand Mixer offers planetary mixing action wherein the beater spirals to ensure complete bowl coverage and faster, more thorough mixing. The KitchenAid stand mixer features smooth, rounded surfaces for extra safety and easy cleaning. Strong, dependable, all-metal construction gives years of trouble-free, quiet service. It features a high-performance 275 watt motor that delivers the power to mix household recipes. You can prepare batter, cookie dough, bread dough, and beat eggs and creams in the large stainless steel bowl that is big enough to handle large recipes. The convenient 10-speed control allows you to choose the speed for mixing – from very high to very low stir. The mixer can easily tilt up for easy bowl removal. The stainless steel stand mixer set also includes a dough hook and a wire whip for versatility. The mixer can be wiped with a damp cloth while the bowl, beater and the hook are dishwasher safe ensuring easy maintenance.